Once the Fed starts raising rates, the world changes, the DoubleLine bond guru says. “Two-thirds of today’s money managers have never experienced a single Fed rate hike,” Gundlach said. Jeffrey Gundlach, the founder, CEO and chief investment officer of DoubleLine Capital, says the Federal Reserve may raise interest rates in December because of the strength in the latest jobs report, but he still opposes the move. In a presentation at this week’s Schwab Impact conference in Boston, Gundlach laid out myriad reasons for the Fed to wait on its first hike in more than nine years, including the fact that workers 55 and older accounted for virtually all the 271,000 jobs gained in October. Still, he said the 2.5% increase in hourly wages from October 2014 could push the Fed to finally make its move. “That is what the Fed is leaning on,” Gundlach said. But he also noted that the Fed could delay once again if the dollar continues to rally; more specifically, if the dollar index (DXY) closes above 100 for two consecutive sessions. Inflation remains subdued, well below the Fed’s 2% target, as exemplified in the Fed’s favorite inflation indicator: core PCE (personal consumption expenditures), which is up just 1.3% year over year. In addition, U.S. headline inflation is currently lower than inflation in the European Union, which has negative interest rates, and the U.K.
U.S. economic growth, adjusted for inflation, is only slightly stronger than European growth: 2% year-over-year versus 1.5% while ECB President Mario Draghi is considering more economic stimulus. “Why is doubling down on stimulus appropriate in Europe while with similar GDP the U.S. is thinking about raising rates?” Gundlach asked. Fed governors are split about making the move. Interest rates are already rising gradually across the yield curve. The only rate that hasn’t risen is the federal funds rate, Gundlach said. The junk bond index, a “great leading indicator of financial conditions,” is at a four-year low. The Goldman Sachs Financial Conditions Index, which rises as conditions worsen, is much higher than it was in 2012. 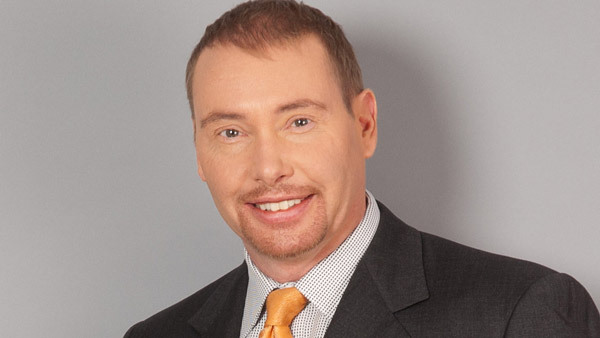 “Why raise interest rates now?” asked Gundlach. He advised the advisor audience at the conference to avoid A-rated corporate bonds – “corporates are the real loser all year” and to “de-risk their portfolios,” namely lighten up on stocks. “Earnings in the S&P 500 are not growing,” Gundlach said. He recommended closed-end funds, noting that they’re yielding 7.7% on average and trading at steep discounts to NAV, near 9%.